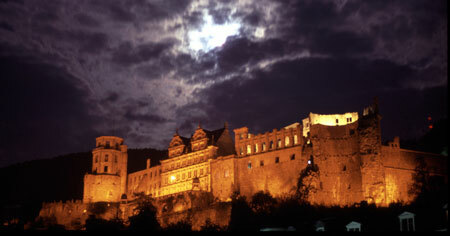 The Heidelberg Festival at the castle forms the climax of the cultural life of Heidelberg during the summer. The castle courtyard, the "Fat Tower" that was converted into a theater as early as 1619 by the Prince-Elector Friedrich V (1610-1623) and is thus the second-oldest theater in Germany, the "English building", the bathing terraces in the castle grounds, the King's Hall and the castle chapel form the impressive backdrop for theater, opera and concerts. The special event of last season: The musical star and celebrated Student Prince actor Kevin Tarte as the Student Prince in a magnificent production by Heinz Kreidl. It was with this role that he began his Europe-wide musical career. Now Kevin Tarte has returned to his favorite role in Heidelberg, captivating his audience through the wonderful melodiousness of his tenor voice and his unparalleled charm. You can download further information, performance dates, and the Castle Festival brochure at www.heidelberger-schlossfestspiele.de. The Castle Festival brochure is also available at HeidelbergTicket, Theaterstrassse 4, 69117 Heidelberg at the Info Tricycle on the Theater Square (Theaterplatz) and at the theater itself. 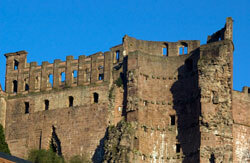 It can also be ordered via www.schlossfestspiele@heidelberg.de. 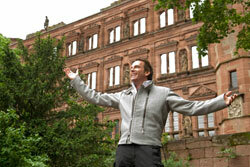 Information, tickets and gift vouchers for the Heidelberg Castle Festival as well as for productions and concerts of the Town Theater and the Philharmonic Orchestra can be bought at HeidelbergTicket, Theaterstrasse 4, 69117 Heidelberg, Tel: 06221 5820000, Fax: 06221 584620000, Email: ticket@heidelberg-ticket.de. Moreover, tickets can also be purchased and printed immediately via www.theaterheidelberg.de. When you buy your ticket, you can select your seats from an online plan of the hall. The text and three photos on this page were kindly authorized and provided by the Theater and the Philharmonic Orchestra of the Town of Heidelberg.